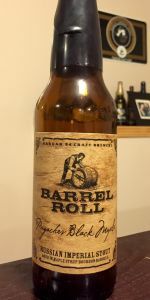 A single barrel of Pugachev's Cobra that spent 6 months resting in a 25 year Heaven Hill barrel, then 8 months in a bourbon barrel that we soaked in maple syrup for 3 months prior to filling with the beer. Yeah, we did that, and it's a one-of-a-kind treat reserved only for our club members. My 1000th Beer Advocate rating. Pours opaque pitch black. A beige head forms only during the pour and quickly disappears completely leaving no lace whatsoever. Big boozy nose with fudge, vanilla, burnt wood and roasted malt. Decadent dark chocolate, smoky oak, maple syrup, faint dark fruit and a hint of vanilla. I was't expecting the roasty, almost smoked, element. Less maple than I hoped for. Definitely a lot going on and certainly a solid brew. Worthy of the hype? You decide. A - Poured pitch black with very little head ~ just a few scattered bubbles. S - Rich chocolate fudge, bourbon, charred oak, smoky maple syrup. A great nose. T - Chocolate fudge and smoky maple syrup notes up front give way to sweet bourbon, vanilla and charred oak from the barrels. A touch of dark fruit in the finish. Remarkable! M - Full body. Creamy and smooth. Very low carbonation that surprisingly doesn't detract from the beer. This is among the very best of the Imperial Stouts one can drink. Thanks to those who I believe are a "joint membership" on the West side of L.A. for opening their only bottle (and it's a small one!) Bottle 94 of 400. This is probably, for my vote, a perfect stout. Black and beautiful. A nose of fresh pure rich vanilla, chocolate, coffee, maple and brown sugar, cherries, oak and it just keeps on going in wonderful layer after layer. The mouth feel is rich, bold, thick, full bodied and just plain delicious. It's big bold and full yet you don't want to sip it - you really want to drink it! A weird phenomena for a giant stout like this one. Flavors follow nose in every respect and it's just wonderful; drinkable and such that it's amazing by itself, with dessert or even with big rich meat. I generally find Hangar 24 a good, solid and decent brewery. However, this offering will rock your world and kicks my opinion of H24 up a big notch. One of my few "5" scores.